Josh and Beth Chandler and David Noorthoek, M.D. purchased the winery in 1999 from Swiss native Hans Kobler who built the winery in 1973. Chandler has a varied background including winegrower, chef, and landscape architect. The Chandlers have added to the original 19 acres of vineyards they obtained when they purchased the property in 1999, and now organically farm 40 estate acres. The original Pinot Noir plantings consist of multiple heritage and suitcase selections. The Philo winery makes about 3,000 cases of Pinot Noir, Chardonnay and Gewurztraminer. The tasting room at 4741 Highway 128 in Philo is open by appointment.. The small production is sold primarily at the winery. Lazy Creek has a well-deserved reputation for Gewurztraminer as well. The Pinot Noirs offered include a NV Anderson Valley Pinot Noir, the Estate R.P.B. Pinot Noir and an Estate Old Vine Pinot Noir. 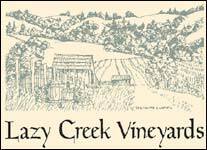 The estate wines are bottled in handsome heavy glass with the Lazy Creek logo embossed in glass on the neck. 707-885-3623. The winery was sold in 2008 to Ferrari-Carano. Ferrari-Carano winery pruchased Lazy Creek winery for an undisclosed sum, in July, 2008. Lazy Creek will continue to be run as a separate facility.